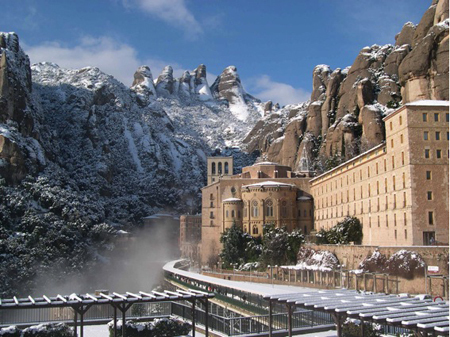 Few places in the world resemble Montserrat in the Catalan region of Spain. There nature, culture, and faith are united as one. Spectacular saw-shaped mountains rise like a geological cathedral about 3,500 feet above sea level to embrace the Benedictine Abbey at Montserrat. Within the Abbey is found the shrine of the regional patroness, the statuary of Our Lady of Montserrat and Child, a flawless gem of Romanesque art. The mountains themselves are an open-air museum in the middle of a rugged landscape containing about 1,050 species of plants. There are various routes up the mountains to the Abbey, but going by cable car only intensifies the gradual and exhilarating ascent into thin air. In the Spanish style, the façade is ornately decorated as is the interior, which is a cavernous place for a plethora of liturgical services as well as for personal prayer. Of note are the main altar―an enormous solid block cut out of a mountain―and a huge stained glass window at the rear of the Basilica. The famous statuary of the Madonna of Montserrat was sculpted in the twelfth century by an exceedingly gifted anonymous artist. 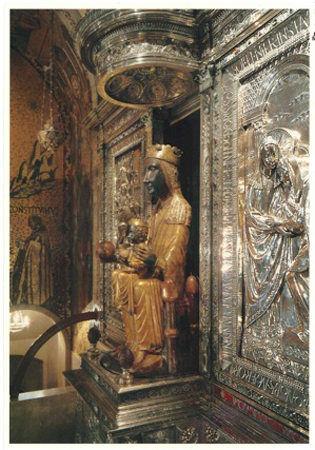 The Madonna of Montserrat is also known as La Moreneta, “the little dark-skinned one.” There is no definitive proof as to why this and other depictions of the Madonna-type are black. A simple reason may be due to the wood having been darkened over time. The verse from the Song of Songs (1:5), “I am black but beautiful,” has been linked to this Madonna-type because it was a favorite phrase at the time. Though a regional shrine, devotion to it has spread throughout Europe. Statuary and sculpture are decidedly western art forms. Virtually every culture in the world that venerates the Mother of God and Divine Child has depicted them according to its own regional view of them. Like the beloved and universally-known Byzantine icon, “Our Lady of Vladimir,” this statuary ranks as one of the loveliest depictions of the Mother of God with Child. It conveys a greater accessibility to the viewer than does the icon. The statue, however, imitates the international Byzantine conventional and stylized form. Its anonymous sculptor offers the West a paradigm of sacred art that has charm, warmth, and beauty. Located in this remote Benedictine Abbey, the statuary measures about thirty-eight inches and is painted in polychrome. One can see a striking resemblance to the statuary of the Egyptian goddess Isis and her son Horus. The Majesty of Sainte Foy (983-1013) in Conques, France, is another model for the statuary of the Black Madonna of Montserrat.2 Antique Isis-Mothers, also called Thrones of Wisdom, were brought back from the Crusades and were kept in the shelter of Christian crypts. They attracted people and pointed them toward Chartres, Rocamadour, and Marseilles. These models were known in the region of Montserrat. A cushion serves as the footstool for this figure which exudes a mysterious presence. This is no ordinary regal figure. Mother and Child are depicted in their idealistic attributes and not as figures of sentimentality. As a sign of asceticism, the Mother’s body is slender, even thin. Her elongated face expresses delicate features: eyes alert and wide-open, petite nose, slightly-curved, depressed in the middle, and an upturned tip. Mary’s fulsome cheeks symbolize plenitude and joy as she reveals her delight in being herself and in being the Child’s mother. Her smile suggests deep satisfaction, redolent of her Magnificat where she recognizes her privileged stature in being singled out among women. Her quiet, jubilant face contrasts sharply from that of the Mater Dolorosa, the sorrowful Mother, a role she will later assume. But for the present, she enjoys her exalted position as do we, together with the Christ-Child. Like Our Lady of Vladimir, the light, radiating over Mary’s black face, makes her entire visage sparkle with radiance. In keeping with the period, her headdress is draped, and beneath the crown, a veil adorned with stars, squares, and stripes in subtle polychrome. The golden-edged border falls symmetrically, encircling her face like a halo that highlights her delicate features. Tunic and cloak gracefully envelop her slender shoulders. Our queen of heaven and seat of wisdom holds an orb of the earth in her right hand, while the other hand, gracefully cupped and extended, monitors the Child’s left side. It is impossible to grasp her inner composure, a stunning beauty in one glance. Here is elegance personified. Not surprisingly, the Child is depicted as the God-Man. His hand is raised giving the formalized and traditional Eastern blessing, three fingers raised (symbolizing the Trinity) and two folded inward to the palm (symbolizing the two natures of the God-man). Like his mother, the Child expresses contentment. He does not grasp his mother but is shown frontally and is firmly seated between his mother’s legs. Though barefooted, he wears a crown and regal garments. Curiously enough, the thin draped covering of their legs accents the knees of both figures with feet firmly on the ground. The sculptor has portrayed a classic Mother and Child accessible to us even as their aesthetic distance remains in place. The verticality, mass, density, balance and symmetry render the statuary a peerless beauty and one capable of bringing its beholders to their knees. Devotion to this image of Our Lady has wrought many miracles, as with the founder of the Society of Jesus, the Jesuit Order. Shortly after his remarkable re-conversion to Christianity, the soldier Ignatius of Loyola was determined to join the army of Christ and went to Montserrat to make his consecration. Before the beautiful Black Madonna, Ignatius transformed the ancient ceremony for the making of a knight into the “new soldier of Christ.”5 In pilgrim’s garb and in keeping with the chivalric code, he kept an all-night vigil there. In March 1522, he placed his sword before the statue of the Mother of God, stood, knelt, sang hymns and prayed with the other pilgrims.6 Ignatius began his new life in God under the inspiration of the beautiful statuary which thousands today revere. A pilgrimage to Montserrat can never be forgotten; it is etched into the memory for immediate recall and savored time and again. It is a feast for the eyes, revealing beauty that leads to prayer. Sister Joan L. Roccasalvo, C.S.J., writes from New York City. Her scholarly research focuses on the relationship between the arts, faith, and culture. She holds PhDs in musicology and in liturgical studies. 1. “Montserrat: Nature, Culture, Spirituality,” booklet published by the Montserrat Tourist Agency. 2. 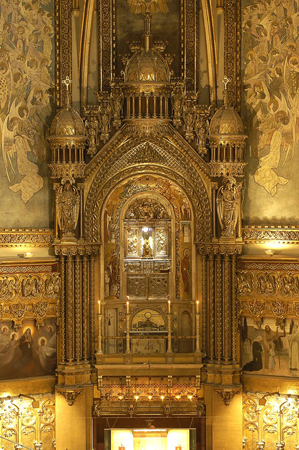 The reliquary statue of Sainte-Foy is made of wood covered with metal and gemstones, glorified bodies being the precious stones of the heavenly Jerusalem wood, gold leaf; precious stones, pearls, enamel; she sits on a throne with her feet on a footstool and her hands outstretched. See Maurice Dilasser, The Symbols of the Church, translated by Mary Cabrini Durkin, OSU, Madeleine Beaumont, and Caroline Morson (Collegeville, MN: A Liturgical Press Book, 1999), 78. 3. Catherine Combier-Donovan, “Mary, Throne of Wisdom: Twelfth-Century Statue, Twenty-First Century Icon,” Envision Church, Jan, 2009. 4. Catechism of the Catholic Church, 721. 5. Pedro Leturia, Iñigo de Loyola (Syracuse: Le Moyne College Press, 1949), 95. 6. James Brodrick, St. Ignatius Loyola: The Pilgrim Years, 1491-1538 (New York: Farrar, Straus & Cudahy, 1956), 86.